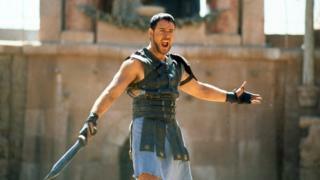 Sir Ridley Scott is reportedly "moving forward" on a sequel to his classic 2000 film Gladiator. The movie won five Oscars, including best actor for Russell Crowe who played Maximus, a once-powerful Roman general forced to become a gladiator. It revived the historical epic film genre and made Crowe a star but his character died at the end of the film. Deadline says the sequel will focus on Lucius, the nephew of Emperor Commodus, played in 2000 by Joaquin Phoenix. Sir Ridley, who won an Oscar nomination for best director for the original, will again direct. The screenplay will be written by Peter Craig, whose credits include The Town and two Hunger Games films, as well as the upcoming Top Gun sequel. Gladiator made $457m (£355m) at the box office and revived the historical epic drama genre, which had been out of fashion for decades. Crowe has previously attempted to have a sequel to the film made. He asked his friend singer/songwriter and screenwriter Nick Cave to write a script. Speaking about it in 2013, Cave said Crowe wanted to star in the film despite the obvious problem. "'Hey Russell, didn't you die in Gladiator 1?' 'Yeah, you sort that out.' So he goes down to purgatory and is sent down by the gods, who are dying in heaven because there's this one god, there's this Christ character, down on Earth who is gaining popularity and so the many gods are dying so they send Gladiator back to kill Christ and his followers." He told WTF podcast how Crowe "didn't like it" but Cave said he "enjoyed writing it very much because I knew on every level that it was never going to get made." Sir Ridley's plan for a sequel sees Crowe's character Maximus leaving an impression on the young Lucius for avenging his own family. Lucius, was the son of Lucilla played by Connie Nielsen in the original film. No timescale has been given for when the film would go into production.